Let me first say that I'm often visiting my own blog to read how I did certain things. This is mostly true for some of the older, more technical posts. 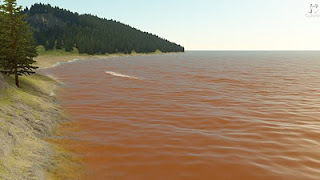 I decided to blog about recent water rendering development in a way that will be helpful for me in time when my brain niftily sends all the crucial bits to desert. I apologize in advance if some pieces seem incoherent. Now for the rendering of water in Outerra. There are two types of waves mixed - open sea waves with the direction of wind (fixed for now), and shore waves (the surf) that orient themselves perpendicularly to the shore, appearing as the result of oscillating water volume that gets compressed with rising underwater terrain. Other wave parameters depend on the frequency (or its reciprocal, the wavelength). Generally, wave amplitude should be kept below 1/20th of wave length, as larger ones would break. Direction of waves can be determined by manipulating the amplitudes of generated wave, for example the directions that lie closer to the direction of wind can have larger amplitudes than the ones flowing in opposite direction. The opposite wave directions can be even suppressed completely, which may be usable e.g. for rivers. Shore waves form as the terrain rises and water slows down, while the wave amplitude rises. These waves tend to be perpendicular to shore lines. In order to make the beach waves we need to know the distance from particular point in water to shore. Additionally, a direction vector is needed to animate the foam. Skew γ=1 gives a normal Gerstner wave. 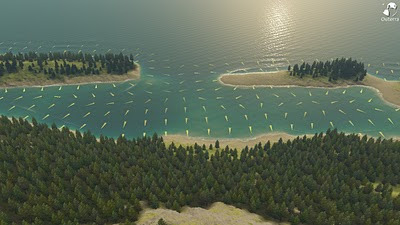 Several differently skewed waves are precomputed in a small helper texture, and the algorithm chooses the right one depending on water depth. Distance map is computed for terrain tiles that contain a shore, i.e. those with maximum elevation above sea level and minimum elevation below it. Shader finds the nearest point of opposite type (above or below sea level) and outputs the distance. Resulting distance map is filtered to smooth it out. Gradient vectors are computed by applying Sobel filter on the distance map. Both wave types are then added together. The beach waves are conditioned using another texture with mask changing in time so that they aren't continual all around the shore. Water color is determined by several indirect parameters, most importantly by the absorption of color components under the water. For most of the screen shots shown here it was set to values of 7/30/70m for RGB colors, respectively. These values specify the distances at which the respective light components get reduced to approximately one third of their original value. Another parameter is a reflectivity coefficient that tells how much light is scattered towards the viewer. Interestingly, scattering effect in pure water is negligible in comparison with the effect of light absorption. Main contributor to the observed scattering effect is dissolved organic matter, followed by inorganic compounds. This also gives seas slightly different colors. Here's a short video showing it all in motion. Better effect for wave breaking. This will probably require additional geometry, maybe a tesselation shader could be used for that. Enhanced wave spectrum - currently the spectrum is flat, which doesn't correspond to reality. Wave frequencies could be even generated adaptively, reflecting the detail needed for the viewer. A few of ocean sunset and underwater screenshots that were posted on the forums during the development. That looks so good! you guys are doing a great job! Amazing work as usual. Are you using patches for your water mesh like a simplified version of your terrain and animating the mesh or is the surface flat and you are animating the normals and texture? Looks fantastic! Can you post pics closer to the water surface? Yes the terrain patches are also being used for the water; meshes are animated too. erm..... WOW this is amazing, you are tuely creating a universe, with god like proportions, i myself am working on something similar but i dont think it will ever be anything even close to what you are doing. WOW really great job. Wonderful water, do you plan to implement tide modeling?